What exactly are you trying to get screenfetch to do, and when ? 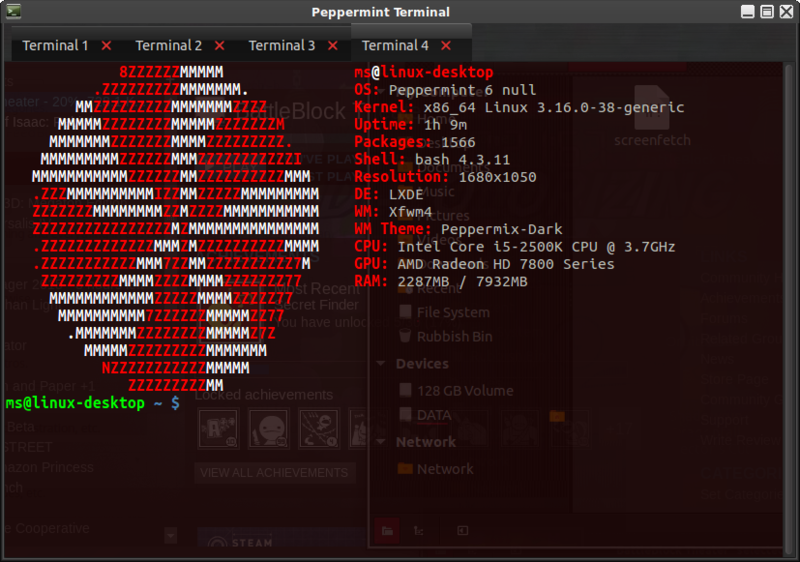 Wanted it so every time I CTRL+ALT+T I would get the picture/readout on the top part of terminal. Depending on which bin location you originally saved to. Save and exit the file. Test by opening a terminal with the keystrokes: Ctrl + Alt + t. That should do it . Very nice indeed . If you want Sakura to open like this when using the other methods of invoking it. Let me know and I'll show you how. What do you think of the Sakura terminal? I really like it. I went to Menu>Accessories>Terminal and that also opened with the picture! I'm less worried about the 4x tabs, was more keen on getting that nice picture and readout every time! I'm all about the window dressing! PS Your instrucs might make a nice tutorial in the tutorial section of the forum. It's a nice little project. which check to see if /usr/bin/screenfetch exists and is executabe .. then attempts to run it only if those criteria are met. it saves the terminal throwing an error if /usr/bin/screenfetch ever gets removed by the user or isn't executable. Yeah, I like it !! Hi Andy, how is is going fella. I would offer an compliment, if I could see any of your pictures, they all have that small deleted/bad image icon. Hi cavy, yeah it's going great mate. How about yourself? I just checked the images. The links are working on both of my machines. They're only links to the image hosting site, imgur.com. This is a bit of a mystery. I have no idea why you can't see them . No problem seeing the images here either, even after clearing the browser cache .. so there must be something blocking IMGUR (or images) on cavy's PC. I know this thread is a little old, but I just came across it and tried all of the instructions. They worked, except that some of the information text cuts across the ASCII image. Is there any way to fix this? Thanks. bash -c "sakura -c 89 -r 28"
Exec=bash -c "sakura -c 89 -r 28"
action=bash -c "sakura -c 89 -r 28"
Save the file and quit gedit. You should now be set. Obviously, set the dimensions to suit your screen. I know it looks long, it is comprehensive . Thanks! That did it. I had to go with 95 instead of 89 for the first value because of the lengthy name returned for my CPU, but I'm now set there.